(Huntsville, AL) – Huntsville doesn’t just have space – it has history, as well. That history will be celebrated throughout the entire month of October as part of Huntsville History Month, a new campaign spearheaded by the Huntsville/Madison County Convention & Visitors Bureau (CVB). Through this initiative, the CVB has curated a digital, month-long calendar of events that focus on Huntsville’s heritage and/or take place in historically significant venues and museums. “The past is a prologue. It helps us to understand our roots and connections and breathes life and meaning into our identities. By recognizing Huntsville History Month, and celebrating our heritage, we’re better able to guide our community into the future,” said Mayor Battle. Through this promotion, the CVB aims to target the heritage tourism market and attract visitors interested in Huntsville’s cultural and history offerings. A recent market research study conducted by the Atlanta-based Tourism Skills Group revealed that museums and history-related points of interest were among the top reasons that visitors come to Huntsville/Madison County. “Whether it’s Huntsville’s unique history as the birthplace of the U.S. space program, our stunning historic neighborhoods, or our variety of museums that bring visitors to our area, we know that people come to Huntsville in part because they are fascinated by our city’s heritage,” said Judy Ryals, President/CEO of the CVB. 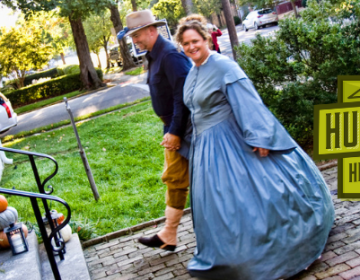 Many of the events included in Huntsville History Month are annual community favorites, such as the Maple Hill Cemetery Stroll, Huntsville Ghost Walks, and the CVB’s own guided walking tours in the Five Points and Old Town historic districts. Although many of the events are returning, several new activities have been announced as part of History Month, including a guided photowalk through the Twickenham historic district, extended dates for the EarlyWorks Breakfast Trolley Tour, guided tours of Lowe Mill ARTS & Entertainment every Saturday in October, history hikes with the Land Trust of North Alabama, and more. Just in time for History Month, the Huntsville-Madison County Historical Society will also debut the new Historic Marker Challenge, which will encourage residents and visitors to learn more about Huntsville’s history by visiting set ‘trails’ of local historic markers. The first two trails, located in downtown Huntsville, are completed along with smartphone apps and downloadable trail maps that guide participants from marker to marker, provide additional historical background information, and track their progress. Downtown Huntsville Craft Beer Trail breweries are joining in the action, with Straight to Ale, InnerSpace, and Green Bus Brewing all creating special beers as part of the campaign, including a Pub Ale from Straight to Ale and Green Bus’s “Twickenham London Porter,” a nod to Huntsville’s original name. The Huntsville/Madison County CVB will also be sharing Huntsville history on the digital screen, inviting the public to share their favorite historical places and little-known historical facts on social media using the hashtag #HistoryHsv. The CVB will be choosing winners every Monday for special prizes based on the creativity of submissions. The CVB’s own blog, iHeartHsv.com, will be featuring dedicated history content throughout the month of October, as well as a special web video series highlighting various aspects of Huntsville history. For more information, visit huntsville.org/HistoryMonth or contact Kristen Pepper, Marketing Manager at the Huntsville/Madison County CVB, at 256.551.2294 or by email at kristen@huntsville.org. The Huntsville/Madison County Convention & Visitors Bureau (CVB) is a non-profit 501(c)(6) organization which was developed in 1970 to create economic growth for Huntsville/Madison County by marketing the community as a top-of-mind convention and visitor destination. As the official city/county agency which promotes the area as a tourist destination and convention site, the CVB works with an array of hospitality industry partners to market our destination to visitors of all types.